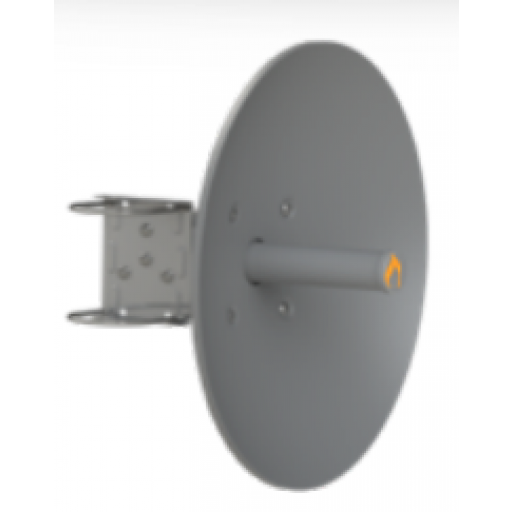 IgniteNet Fusion Dish is a high performance 0.6m dish for the 5GHz unlicensed bands. Its reimagined design is centered on three key ingredients: simplicity, performance, and integration. This model uses dual RP-SMA pigtails for attaching radios. The bracket is designed as two pieces to allow for easy installation, and only requires one tool. The Fusion Dish also features a redesigned waveguide to enable low-loss radio connections. • Dual Polarity or Dual Slant: Designed to support both dual polarity (H/V) as well dual slant, depending on assembly. • Versatile, Robust Mounting Design: Innovating mounting design allows for poles varying in size from 5 to 11.4cm (2 to 4.5in.) in diameter. In addition, adjustment from +/-30 degrees are made simply and easily. • Port to Port Isolation: 35dB min.